The market for online courses has grown rapidly over the past few years, enabling anyone with an Internet connection to receive world-class knowledge for a small price. This represents a huge opportunity for those willing to share their knowledge. Last year, 10 teachers on the online training platform Udemy earned over $1.6 million from selling online courses. Another teacher, who previously earned $30,000/year from teaching, now makes over $1 million selling lesson plans to other teachers online. If you have specialised knowledge that others are willing to pay for, the only thing stopping you from creating an income source from selling online courses is creating your first video and finding the right platform to sell it on. In this post I want to focus on which platforms are best for selling courses online, and look into each platform’s pros and cons. While there are countless options to choose from, I’ve limited this post to four of the most popular and powerful options: Kajabi, FusionHQ, Udemy, and Academy of Mine. To kick off, we’ll look at Kajabi. Kajabi is the most popular online platform for selling digital products online. Built by Kenny Rueter and Travis Rosser, who are both information marketers themselves, and used by some of the most renowned online instructors and information marketers, it’s got a strong track record. So, how does Kajabi work? Kajabi lets you create a customised private membership site or dashboard where your members can access your information products (videos, audio files, articles, templates, reports etc). To become a member of your site, they must pay you for access (usually a monthly subscription fee), which is all handled by Kajabi. When you upload your files, they can be published to your members immediately, on a specific date, or drip fed over time so that new content is released every week, month, or at whatever interval you choose. Kajabi also lets you set membership tier levels, so that different members can have access to different files. The platform allows you to set up a referral program, create landing pages, and use a range of proven templates to encourage people to sign up to your online course and engage with your content. There is also the ability to create an online community where members can talk to each other and comment on your content. The whole platform is cloud-hosted, meaning you needn’t worry about anything technical (no installing files, finding web hosting or installing CDNs). With a 30-day free trial and a $99 starting plan, Kajabi is one of the most affordable hosted online training platforms. For comparison, Academy of Mine starts at twice the price ($199/month), while FusionHQ starts at $147/month. FusionHQ was one of the first platforms built for selling information products online, including online training courses. While conceptually very similar to Kajabi, FusionHQ is less focused specifically on online courses, and has a lot more functionality around automating your marketing and sales funnels. 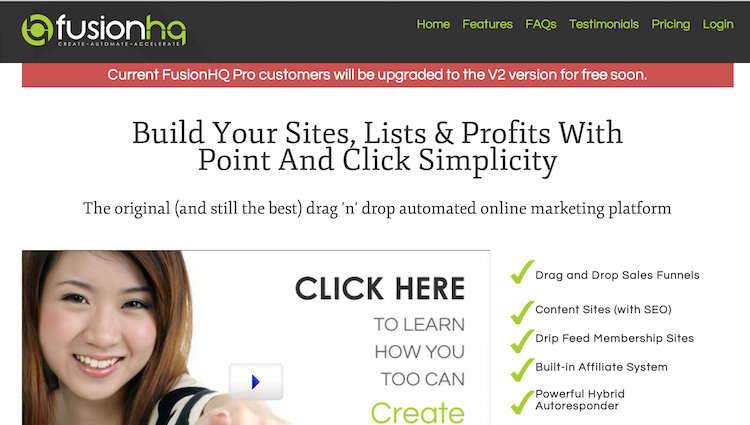 FusionHQ market themselves as being a complete online business platform that allows you to build an online business with everything you need in one place: split testing, email lists, affiliate programs, membership sites, landing pages etc. Like Kajabi, it’s entirely hosted so you don’t need to worry about any of technical set up or infrastructure. One of the main benefits of FusionHQ is that their user interface is beautiful and extremely easy to use. Everything is done in a drag and drop editor, so no coding knowledge is required. Academy of Mine is designed specifically around selling online courses, and while it has many of the same features as Kajabi and FusionHQ, there are a handful of unique features dedicated to selling online courses. For example, Academy of Mine allows you to live-stream classes, go into 1-to-1 chat with students, and do whiteboarding & screencasting with students. You can also create quizzes, exams, certificates and badges for students to earn as they complete different modules of your training course. The reporting tools on Academy of Mine are very insightful, providing information on aggregate performance of courses, as well as individual student progress. Starting at $199/month, Academy of Mine is relatively expensive, but being entirely targeted towards selling online courses, you’re really paying for the extra features that are designed specifically to help you market and sell your courses. About six months ago, I created a short free course on how to setup a WordPress website on Udemy, as I already had the material filmed and was interested to see how the platform worked. Frankly, the experience wasn’t great. While their platform is very sleek and easy to use, and has over 22,000 courses, their approval process is a bit of a nightmare to deal with. Not only was I receiving emails from about four separate staff members about getting my course ready to go live, but there were lots of hoops to jump through in terms of encoding the videos and editing the course’s description. While this is all totally understandable from a quality control perspective (and the second time you do it it’d likely take less time), it does make uploading your first course quite painstaking. My experience aside, Udemy is one of the biggest marketplaces for buying and selling online courses, and with over 5 million students, you have your audience taken care of. One thing that I did particularly like about Udemy was that they’re proactive in promoting your course. With no promotion from my end, Udemy have sent over 250 students to my course by featuring it every now and again. Whichever platform you choose to sell your online course on, you’ll be in good hands. While Kajabi generally works out to be the best value option, there are certain features that FusionHQ, Udemy, and Academy of Mine offer which can swing the needle in their favour. If you’ve used one of these services in the past, I’d be intrigued to hear some previous customer’s experiences of any of these services (or any that are worth mentioning that aren’t mentioned here). What about Vimeo as a video training course platform? One thing I would have stressed in this article is that Udemy is essentially free. Any courses you sell where you bring the customer you get basically 100% of the money. If Udemy brings you the business then you get 50% of the business you wouldnt have had anyway. So the only real “price” is the little hoop jumping they make you go through.